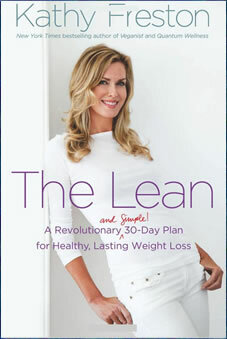 The Lean Diet is a weight loss program created by Kathy Freston, author of Quantum Wellness and Veganist. Says Freston, “Weight loss doesn’t have to be hard. It’s about setting an intention for what you want … and then nudging yourself ever so gently in that direction.” Her program is designed to help you gradually make healthier choices, without the need for extreme diets. This is a 30-day program that teaches you how to feed your body the delicious and nutritious foods that it thrives on. You will learn to face your food addictions in stages: little by little. At the same time you also have the opportunity to adopt a new way of thinking about what you eat. For each day of the program you are given a different task to complete. It may involve trying a new food or switching a food for a healthier option. You are also given assignments related to emotional wellbeing. By the end of the 30-days you will have thirty new habits. You are not required to give up any of your favorite foods. You simply take gentle steps away from the choices the made you heavy and toward the choices that make you feel better. On The Lean Diet there is no need to calculate grams of carbohydrates and protein. Instead it is much better to focus on how you feel when you eat certain foods. You will gradually move away from eating animal products, sugar and refined flours as you include more plant-based foods. Nutrient-dense, high fiber foods are the most effective at eliminating cravings and help you lose weight healthfully and keep it off for good. Steel-cut oats, brown rice, quinoa pasta, whole-grain bread, chick peas, black beans, veggie sausage, tofu, avocado, sweet potatoes, kale, apples, goji berries, blueberries, peanut butter, almonds, walnuts, flaxseeds, chia seeds, soy milk, dark chocolate, cinnamon, green tea. Readers are encouraged to do at least half an hour of aerobic exercise each day such as brisk walking. You could also try activities like washing your car, gardening, basketball, biking, stair walking or jumping rope. If you are new to exercise, you can start with a ten-minute walk before breakfast, on your lunch break, or after dinner. It is also recommended to do some strength training because it improves your metabolism and ability to burn fat. The Lean: A Revolutionary (and Simple!) 30-Day Plan for Healthy, Lasting Weight Loss retails at $25. Promotes the consumption of nutrient-dense, high-fiber foods. Encourages a gradual transition to a healthier diet. You don’t have to give up any of your favorite foods. Addresses the importance of psychological balance for long-term weight management. Weight loss may be slow at the beginning of the program. Encourages the use of processed foods such as soy cheese and imitation meats. Some readers will require more structure and support to create a healthy diet. The Lean is a 30-day program that guides you in the process of making a gradual adjustment to a healthier diet. As you start to eat more nutrient-dense foods, your energy will increase and cravings are eliminated. This makes it easier for you to lose weight naturally without the need to make extreme changes in your diet.